Whew! What a time! And lots of moving books inbetween! Tomorrow's the last day to move out everything from my Mother's book store... ugh. I'll let you know if I survive. 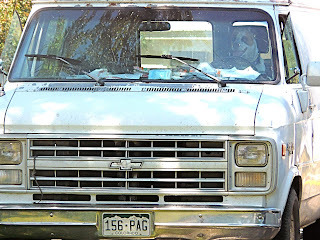 But seriously, I read a great thing that Crested Butte (ski town just up the road from Gunnison) is doing. All summer they sold "Butte Bucks" - $100 worth for $80. On then used the bucks at local establishments. A great way to encourage people to shop local! The bucks expire soon, but I bet they'll be back next summer... Read about it here at the Chamber of Commerce website. 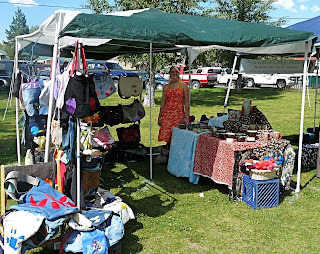 This weekend was a big hot-rod and car show in Gunnison, and to entertain any women who may have been dragged to the show (as opposed to going freely of their own volition) there was a craft fair. So I went up to stay with my sister and hock my wares. The night before they had rock-a-billy music and old-school burlesque at the bar, so I was up late enjoying alcohol at high altitudes. Fortunately the morning was quite cold and that kept me moving to stay warm. 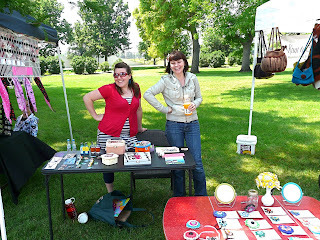 It became a beautiful day in the park, with music and the sound of reving engines. Totally worth the drive to see the lovely mountains and hang out, I even made a little bit on money! Well it's that time of year again, the dreaded march back to school. And I'm a little nuts, so I'm taking six classes for a total of 12 straight hours of school time, two days a week. Sorry if I don't update the blog a whole lot! What options do we have? 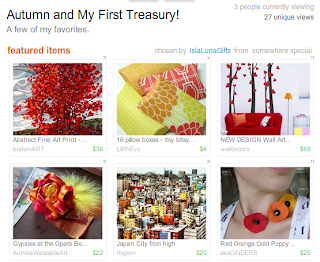 Let's have a little look around etsy! Since we're all crafty here, how about a pencil for your pencils? 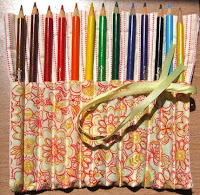 AJollyShop has this lovely pattern for pencil hiding pencils. Best part? Make one in every color to match any possible outfit. Nothing is more stylish than matching your school accessories. Since I'm a little OCD my best option would be a case like this one from UrbanCrunch. For those who need need need organization in their life. For more than color in fact, who doesn't want the hb's far from the h6s? In colorful floral print no less, a win-win operation! Yaarrgh matey, need a writing implement? As usual I have to include a recycled option, and this one has pirates. Can't go wrong with pirates! 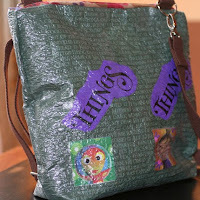 Trashbaggs' upcycled plastic case includes a loop for carry and 100% cheddar free interior. Or for you book worms, how about this DAAAAAW little pouch? Super kawaii! 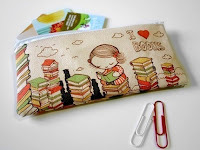 Kukubees's custom fabric design makes a perfect place to hold your little sundries, books not included. Need a bookbag for your school days? Check out my etsy shop and see all the roomy sturdy fashionable totes available for your school day pleasure! I am spoiled to be able to carry a new bag every day, treat yourself (or the student in your life) to a new bag for the semester. It will last for semesters to come! That's right, the Zucchini baby met her doom. 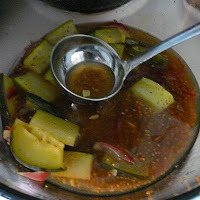 The sad thing is, this pickling project didn't use up the whole thing! There's still a good chunk in the fridge. So first you need good fresh firm zucchini. I used a recipe from Pick-it-your-self, though the same recipe is all over the internet, tried and true! First I chopped up the zucchini. You want to have fairly uniform pieces for ease of packing in jars and for proper infusion of the brew. 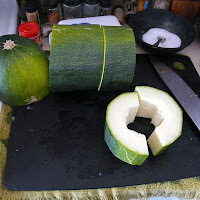 I cored part of my zucchini as it was getting fairly thick seeds, but that shouldn't be a problem if you caught your zukes in the smaller stages. Soak the zukes and onions in salted water for two hours. About a half hour before they are ready to drain start cooking the brew. It's actually a fairly standard bread-and-butter recipe, and one could change the spices if you wish. But don't alter the vinegar/sugar/vegetable ratios! 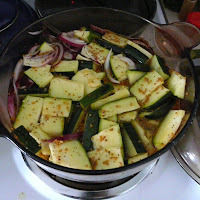 Drain the veggies and add to the brew, simmer for five minutes. NOTE - if you hold your head over the pot to inhale the steam your nose hairs will curl. It smells like vinegar, quell that curiosity! While boiling the mix I heated the jars in the same pot I'm going to pasturize in. Remember to heat and cool glass slowly! The funny holed item in the bottom is a canning lift. 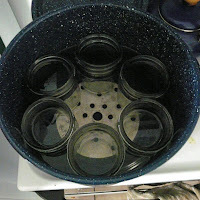 It keeps the jars off the floor of the floor of the pot and keeps them away from too intense a heat. Fill the jars with the hot mix. Use a tool to shift things around and get more zukes in the jar. 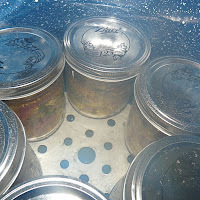 Be sure you leave a 1/2 inch headspace - that is room above the liquid and food. This is to prevent overflow while you are boiling the food in the jars I had some extra to I put it in the fridge to get eaten first, though the best flavor won't develop until after two weeks. Arrange the jars in the pot and do the final processing. I did the pasturezation method which is good if you have a thermometer. Thirty minutes later and we have lovely pickled zucchini, waiting for the cold winter months when the summers bounty is gone. 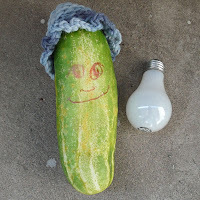 (looking at our stash of zucchini and yellow squash, about april) Now write your self a sealed letter to be opened at planting time reminding us not to plant so much zucchini! ... or, How to let people know you are truly crazy! So you weren't going to do it this year, plant zucchini again. You said no more! But over the winter you forgot, the promise of zucchini bread, of sauteed veggies, of Italian dishes; And you said "just one hill". Or perhaps you stayed true, you didn't plant any. But one morning you were out at the compost pile and saw a volunteer curcubit sprouting. "Oh! a melon..." and you moved it into the garden. Soon the second leaves were coming out, not round like a cucumber, nor the smooth melon, you hope "Pumpkin! surely it's a pumpkin." then one day you are out in the garden, you pull aside the canopy of spiky flora, and there it is. The dreaded green zucchini. Hidden in it's own vines. 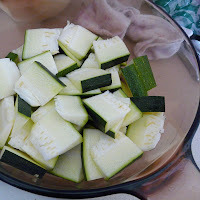 The other morning my mom was out dutifully picking, getting the zucchini while they are small and tender. She pulls two off, and notices below them. The monster! 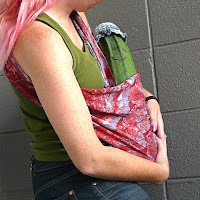 This Zucchini Baby was delivered at 9:12 AM, 7lbs. 2oz. Now begins to the fun. 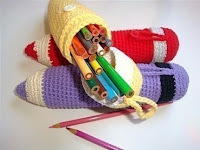 crochet a baby hat. 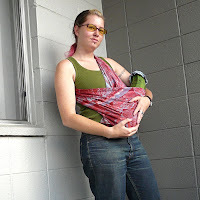 find a baby sling. Make it a face (extra credit for googly eyes!). Take it out on the town! Ride your bike, watch as people stare at your recklessness. If any one ask about the safety you can simply reply "It's OK, it's already a vegetable"
Take it to the store, wait until asked to reveal it. When someone inquires if it's a boy or a girl, say "I dunno, you tell me!" Note that women with human babies will not find this amusing. The rest of the populace seems to think it's great. Be sure to coo at it and dangle toys in it's face for authenticity. IslaLunaGifts caught the treasury bug. 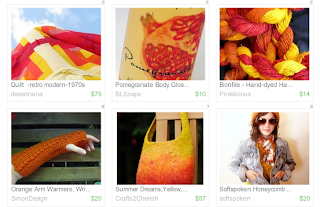 For her first ever selection she chose wonderful autumn colors! Check it out here! Are you ready for this Sunday? It's gonna be good! The Denver Handmade Craft Fair is back and even bigger. In addition to many returning vendors there are gobs of new ones! Barring cancellations there will be 23 booths with nearly 30 vendors! 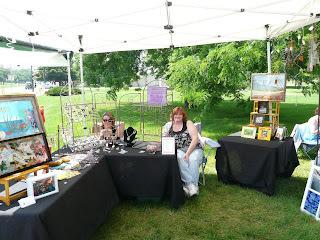 There will be, in no particular order, glass, glass jewelry, beaded jewelry, recycled jewelry, knit accessories and knit bags and knitting supplies (yarn and roving!) 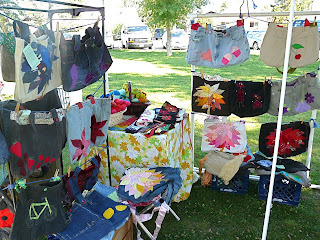 wallets, recycled wallets, plushies, ceramics, bags, fine art, housewares, hair clips... wow! 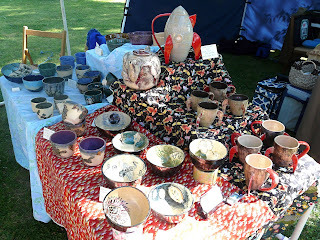 Tons of really great stuff from some amazing artisans. 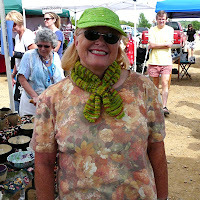 If you are disinclined to make your own plarn, or just don't have the craft skills to crochet one courself, check out CaraTaylor's shop. 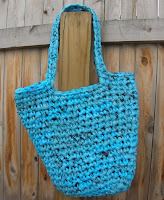 It's full of totes, cluches and purses all made from upcycled plastic bags. 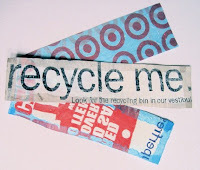 If the enviromental benifits of reuse and reduce don't draw you in , the bright colors will! Got an iron you don't love? You could use it to melt plastic bags on to them selves, and use the fused material for a wide variety of goods! 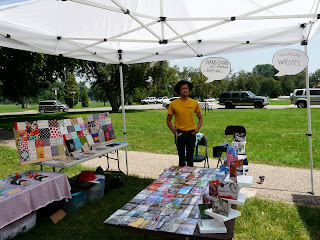 Like UrbanCottageCoalition's sweetly placed and well trimmed book marks. With all the cool things printed on bags nowadays you could make marks more interesting then some books! Lest week I pulled out an old loom that had been stored in the garage. My sister actually found it in a dumpster and pulled it out for me. It was beat up and I was in a tiny apartment so it was put away for a year. 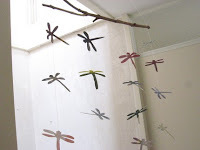 I attempted to assemble it, and discovered the heddles are no longer hung, and there was no indication about how to string them, so I went on the search. 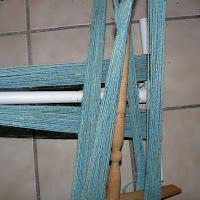 I called many shops, and finally dragged it up to Shuttles Spindles and Skeins. They are absolutely great with things like this and really went out of their way to help me, and never ask for a cent! Unfortunately the consensus was "Well, all the pieces are there, don't know how they hang though..." So I took my research off the net and into the archives, Mom's Book Store that is. 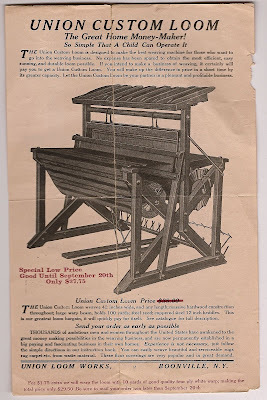 Not, unfortunately the loom I have, but what a great sales piece! "in a few moments of spare time a day one can find a profitable home business..." The reverse has an image of their smaller "home loom". Stashed with this flier was a letter from the company. It seems a lady had attempted to order the smaller loom and they were trying for the upsell. "truly profitable!" The Shuck and Jive never ends eh?